Oh happy day! Our local Farmer’s Market’s are officially in full swing. They have become such a great way for me to be inspired. I just love wandering around and looking at all the beautiful produce available. Each week something new is discovered, and for me it’s just wonderful. 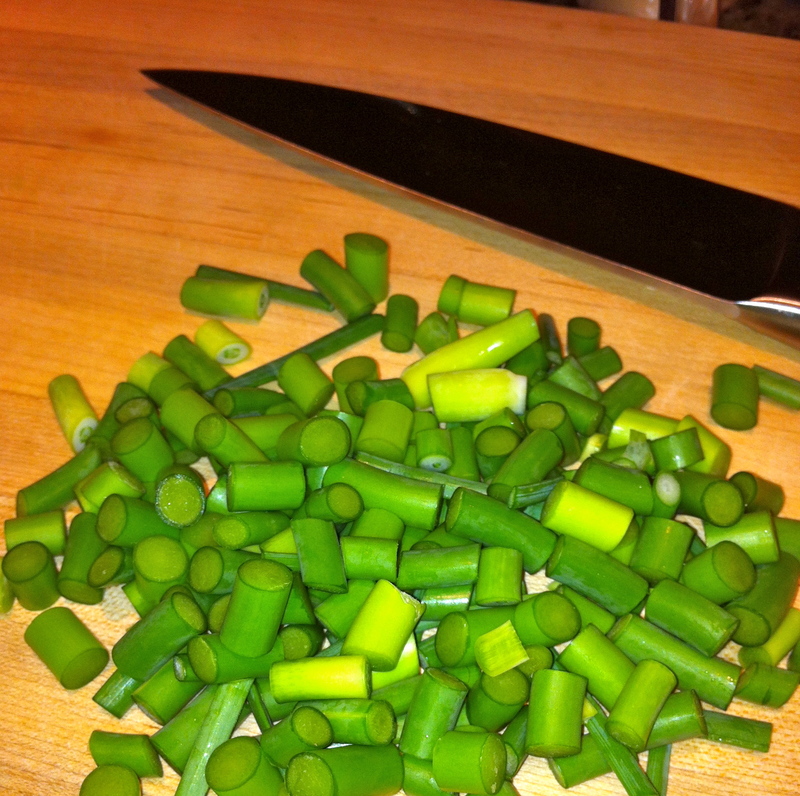 So imagine my excitement this week when I happened upon the scapes …. Garlic Scapes, or “scape” for short, is another really cool ingredients you can typically find in the late spring and early summer at the Farmers Market. If you love garlic – then this is the ingredient for you! Scapes are the long twisty tendril that grow above hardneck garlic. There are several varieties of garlic that are divided into basically two categories: hardneck and softneck. Hardnecks have a hard stalk running through the center and the cloves are circled around it. Softneck has no stalk and the cloves are tightly packed around each other. What you generally find in the grocery store are the soft neck varieties. Hardnecks are what yield the scape and usually are found at the farmers market. 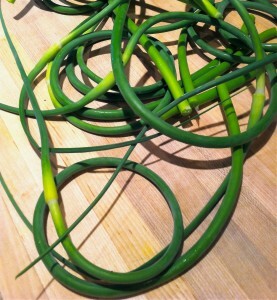 Scapes are harvested when the plant is young so the bulb will grower bigger. These curly tendrils are smooth and dense to the touch, and have a sharp garlicky bite in flavor. 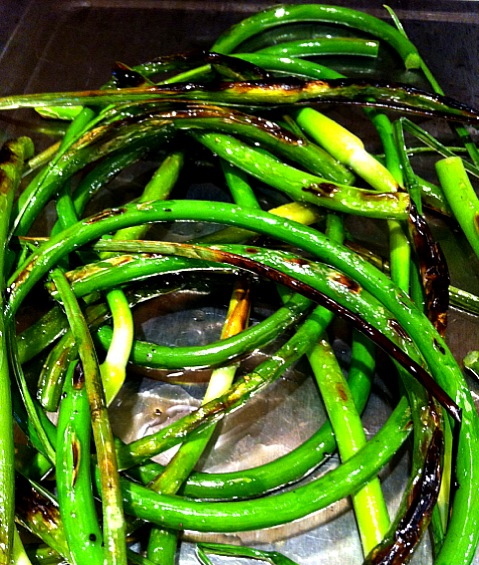 Scapes contain a fair amount of protein, vitamin C and calcium. They are a versatile ingredient to work with: you can eat them raw, grilled or combined into something. 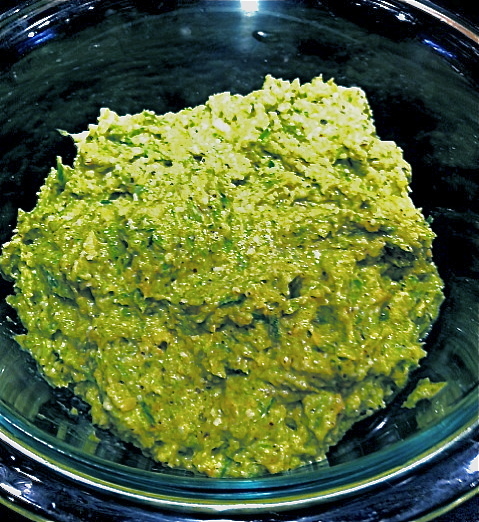 The most typical application is making them into a pesto. 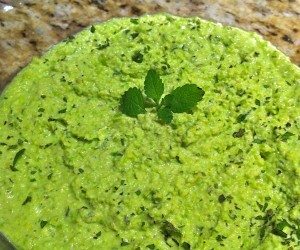 After doing a bit of research I decided to go ahead and do a pesto for you .. but of course put my own spin on it! Most articles and recipes I came across talked about using the scapes in their raw state. I wondered how the flavor would change after I grilled them? The result, after getting a nice char, was a beautiful mellowing of their sharpness with a hint of smokiness. This pesto (recipe below) can be used a couple of different ways: first, you can spread a little on a crisp slice of bread and top with some grilled squash for an appetizer; or you can add it to your favorite pasta. As luck would have it, I will be doing just that at the Irvington Farmers Market today at 4:30. I hope you can stop by for a taste. But wait! Last night I ended up making another dish. I saved a couple of tendrils to add to our dinner salad, but had another idea: what about hummus? After spotting a half bag of edamame beans in my freezer I wondered how that would taste. 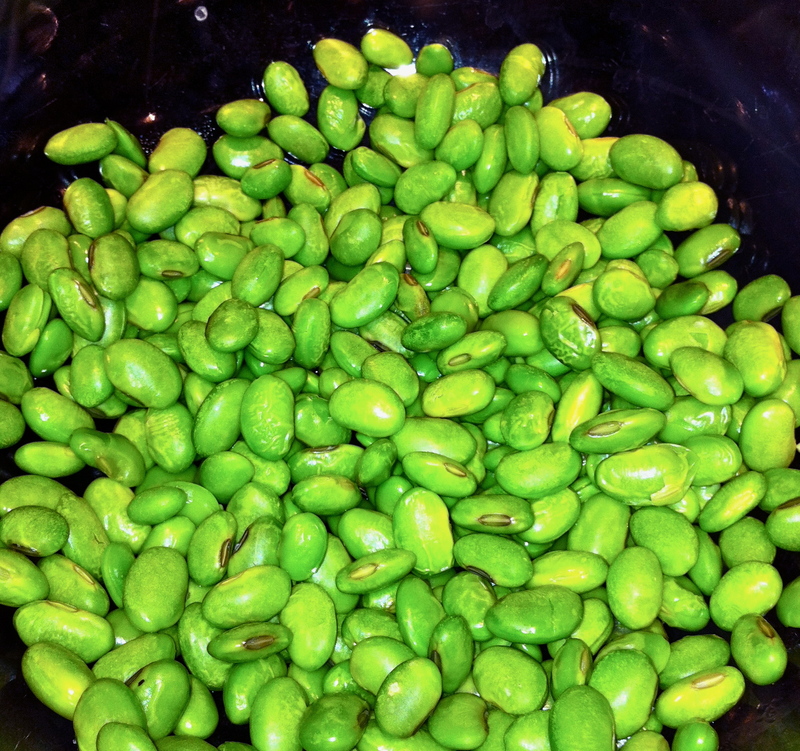 Edamame are young soy beans harvested when they are still green. They are packed with protein, fiber and a just a small amount are nutritionally a big bang for the buck. I always keep a bag on hand to toss in to pasta or over a salad. Since I was literally doing this on the fly before dinner I needed to make it in a snap. The beans got a quick cook in the microwave while I chopped the scapes. All went right into the food processor and with a couple of added ingredients, that I knew would enhance the flavor, I was done with this in less than 10 minutes. 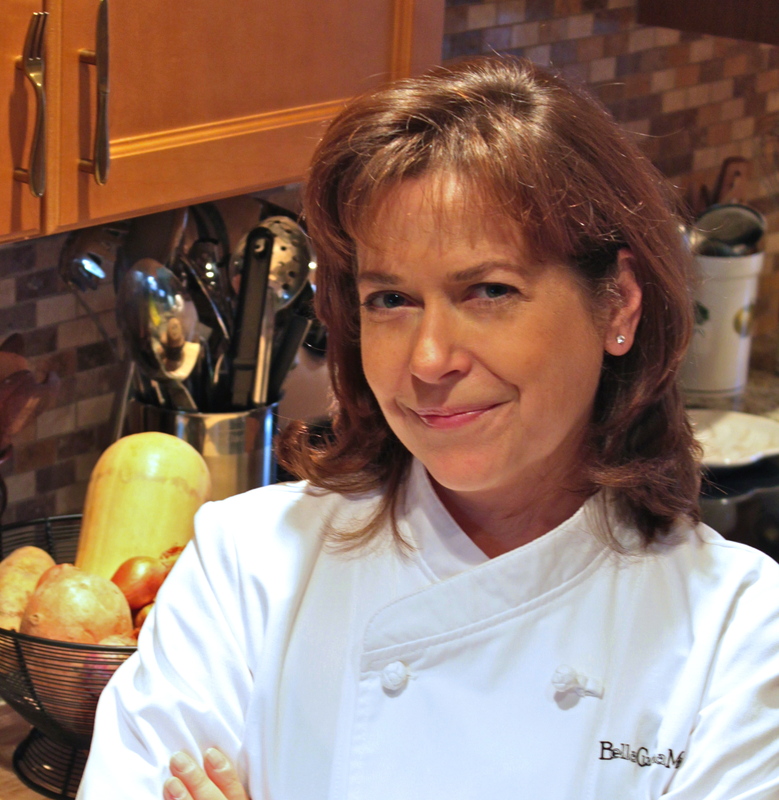 The only ingredient you may not have on hand readily would be lemon balm. I happen to have it growing in my backyard. Lemon balm comes from the mint family and grows like crazy. The next time you are at a nursery or at the Home Depot flower department look for it and bring it home. You can easily grow it in a pot on the patio. It’s flavor is a revelation: herbaceous and lemony. I love adding it to anything that I want to extend a lemony flavor-note. If you don’t have lemon balm you could easily add cilantro, which would work well with the cumin in the recipe. I think a nice herb kick sets this dish over the top. As I mentioned above, I will be in Irvington today and on Saturday morning at the Hastings Farmers Market. I’ll be working with scapes there too! Please stop by and say hi if you are in the neighborhood. Garlic scapes: if you’ve always wondered about this whimsical ingredient and never knew what to do with them, I hope these two recipes will change your mind. Toss the scapes with a little olive oil, salt and pepper and place in a hot grill pan. Cook until slightly charred and soft. Remove and cool. Place the scapes and their juices in a food processor with ½ teaspoon each of salt and pepper, and whiz until finely chopped. Scrape down the sides and add almonds, lemon zest, juice and cheese; processing after each addition. With the processor running slowly drizzle the olive oil in until the pesto comes together and is the consistency you like; about ½ to ¾ cup. Taste for seasoning. 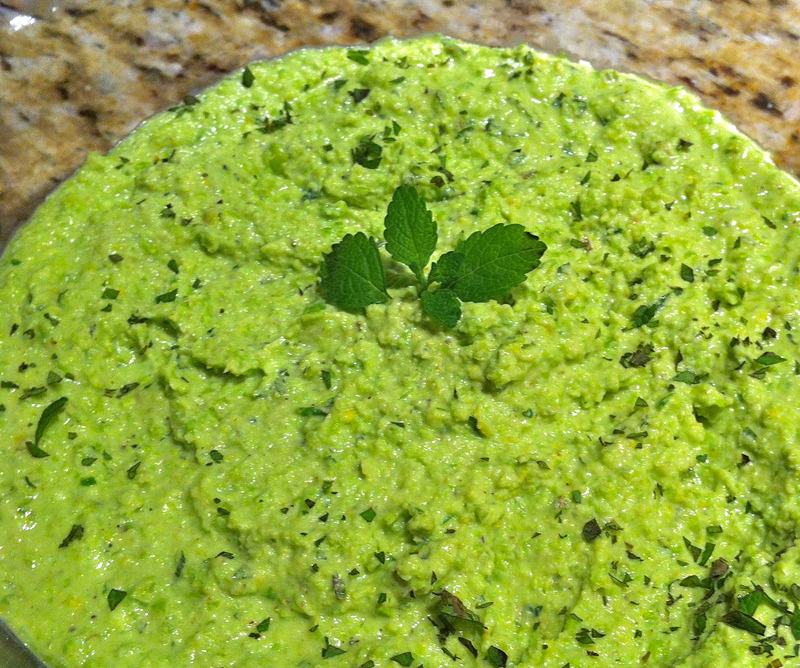 This super easy pesto has a nice refreshing bite to it … and works perfectly with pasta or even spread over a little toasted bread with grilled veggies. Cooks note: If you end up with leftovers freeze it in an ice cube tray and place in a zip lock bag. Rinse the beans and set in a glass bowl. Cover with a damp paper towel and microwave for 2 minutes. Remove paper towel and allow to cool. Roughly chop the scapes and place in a food processor. Add the cooled edamame, lemon juice, zest, cumin, coriander and 1 teaspoon of salt. Process until you have a thick paste. With the machine running slowly add the olive oil and then the water until you get the consistency you like in a hummus. Taste for seasoning and add the chopped lemon balm if desired. 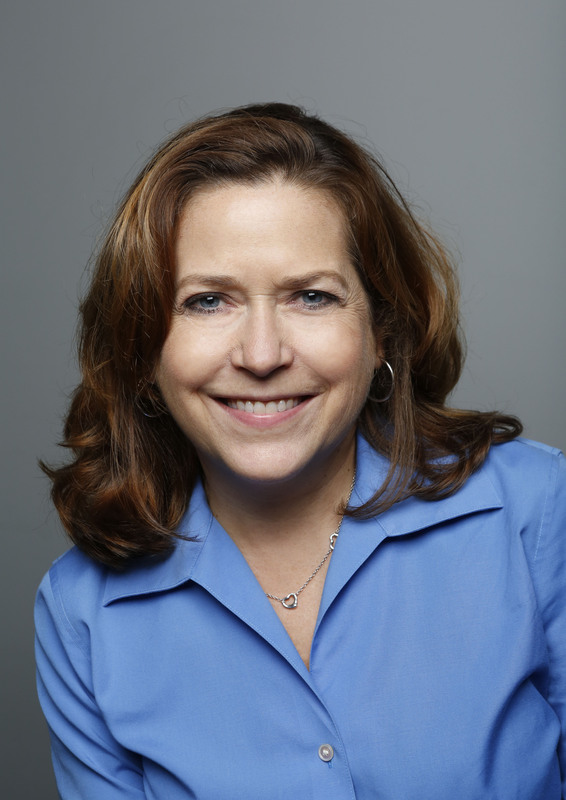 Maria, great post! I picked up scapes this weekend and decided to make a pesto also. I can’t wait to try hummus – yum.